Hamas has refused to accept fuel from Israel and now is coping with a deepening economic crisis by offering free lifts to workers. 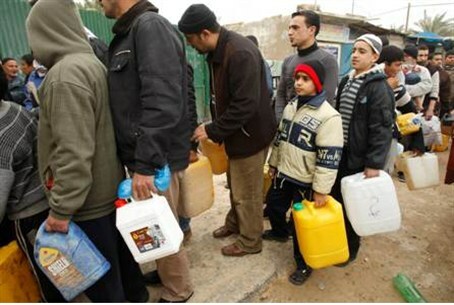 Gaza Arabs line up with fuel containers. The de facto Hamas government in Gaza ordered civil servants to offer rides to people during daytime work hours in order to survive the self-imposed lack of fuel. In addition, Hamas cut in half the fuel allowances for its 1,800 official cars, according to the Bethlehem-based Ma'an news agency. Hamas ministers said the lack of fuel is due to the alleged Israeli blockade, which has in effect been lifted on all materials not used for terrorist activities, but the local administration has refused Israel’s offers to continue fuel shipments. The Gaza government also turned its fury on the rival Fatah-led Palestinian Authority based in Ramallah, accusing it of stopping the European Union from funding a power station in Gaza. In the meantime, Hamas remains dependent on Egypt, which is dominated by the Muslim Brotherhood of which Hamas is an offspring. One benefactor of the fuel shortage is the tunnel smuggling industry and Hamas, which imposes heavy taxes on fuel and merchandise brought into Gaza from Egypt via the tunnels.